Because this congregation likes to spend time together, periodic opportunities for “R&R” are provided at local retreat centers. Retreats are offered for multi-age groups, youth, confirmation participants, and others as the needs arise. One-day, two-day, and weekend experiences have been enjoyed throughout the years. Occasionally we take excursions to special places such as Joshua Tree, Death Valley and even Ireland. “Thin places” are described as those places in nature where the experience of the divine is palpable. These places help us to remember and connect with the Spirit that is always with us. Take a spiritual walk on RUCC’s own holy site–a labyrinth that is just off the street entrance on Olive. It’s a great way to cleanse the mind and center your spirit. Find out more about our labyrinth and how to use it. The United Church of Christ has a wonderful daily devotional on it’s website. You can subscribe for it to arrive in your email or bookmark the page for thoughtful and poetic inspiration. The page also contains links to other spiritual practices that you may want to incorporate into your spiritual development. RUCC hosts outside groups including a T’ai Chi class on Tuesday evenings at 6:00 pm and a Yoga class on Friday mornings at 10:30 am. Spend time in meditation as you roam RUCC’s beautiful grounds and Memorial Garden. 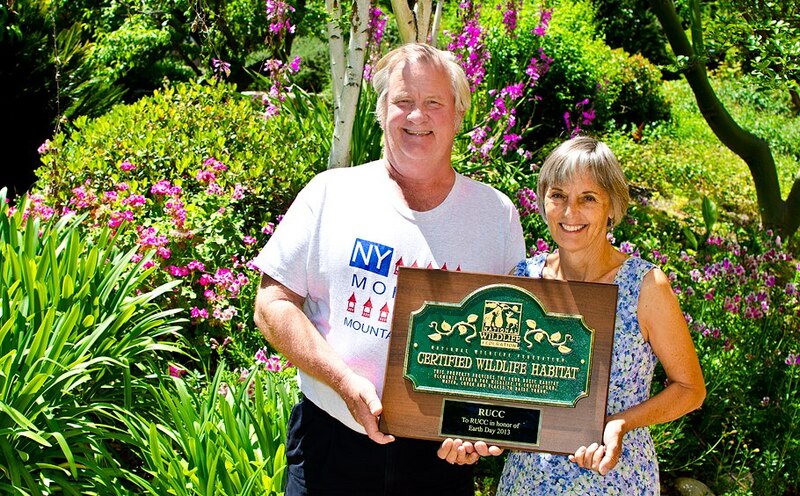 Our grounds have also been declared a Certified Wildlife Habitat.